Today we thought we’d celebrate the wonder that is Paper.li by adding it to the hallowed Gun Cabinet archive. paper.li organizes links shared on Twitter into an easy to read newspaper-style format. Newspapers can be created for any Twitter user, list or #tag. The personal element is useful, erm, personally speaking. You can read mine here, should you wish. Where we think there is most potential for PRs though is in using #tags to capture a summary of event news. Take the #IFA one we’ve created, for example. It’s a nice piece of ‘added value’ to share with clients on each day of a trade event, as a summary of the big show news. I need to play around with it, but I think could probably create a bespoke Client@Event newspaper as well. 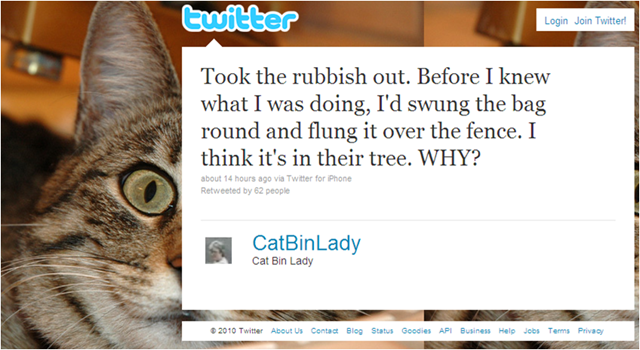 CatBinLady – a social media masterclass? note, she’s gone up another four hundred followers since i began to write this. A New Twist in the Copyright Tale? A new twist in the copyright tale and the question of rights was raised in Germany’s Der Spiegel today. A German historian argues that Germany’s rapid industrial expansion in the 19th century can in fact be attributed to an absence of copyright law. Nicholas Carr’s book, The Shallows: What the Internet is Doing to Our Brains, is certainly provocative theory and a great read. Essentially his thesis boils down to the argument that the ability to search and access the world’s information means that our habits of concentration and work have changed with growing web usage. This is causing our brains to evolve to a different pattern of skimming information which he claims is rather shallow, hence the title. Despite all the hype that surrounds the new media darlings of Twitter and Facebook, when it comes down to the nuts and bolts of business, more time, effort and most significantly money is spent by businesses focussing on search than anything else, so the behaviour of companies suggests that he may have a point. Carr succinctly describes a powerful group of Influentials we have observed participating in online conversations – the ‘viewer’. The characteristics of a viewer are relatively simple; they are searchers. Viewers seek information about a topic that is important to them and transient in their community memberships. Individually they contribute little to the addition of content but savour the information that is freely available to make ‘informed’ choices. The people who invariably influence this group are those with one significant attribute – Google juice. Therefore the algorithm running at the heart of search reflects the core reason why these viewers make the decisions they do because they make judgements as they skim. Carr, I believe, underestimates the engagement the viewer has with the content. It may be shallow but it is not irrelevant as it is the frequency and speed of interaction that makes a true ‘influential’. They don’t need long to understand and they certainly make judgements by synthesising and aggregating thoughts very differently from traditional opinion forming, but this is not superficial. The power of this engagement is illustrated by how these patterns of search create endorsement for deep content experts such as ‘idea starters’ and ‘curators.’ It is the viewers’ choices on Google that give a democratised influential their authority. If these choices were as superficial as Carr believes, these new influentials would be an arbitrary selection of noisy web citizens. They are clearly not; even lesser known influentials stand out for the veracity of their opinions and depth of content. As I said, Carr’s book is a great read and makes a powerful point about the changes the web has created in the dissemination of knowledge, but he has not fully explored how this dynamic works and therefore over emphasises the negative points and does scant justice to the new benefits of the web and how it engages us with influential thought and knowledge. Is Digital dead in UK music? Last week, I had some very interesting discussions with a well known UK music consultant Daniel Cross (head of Record-Play), who also runs an East-end indie label called TAPE. He was talking about the shifts he is seeing in the UK music industry and, yes, wait for it: digital is dead. No, not really. But that got my attention too. Rather, the model for revenue generation in music is shifting. TAPE – and indeed, many UK indies and industry heads – don’t even count digital as a serious driver of revenue anymore. And you can hardly blame them when labels make around 0.01p per play on music streaming services like Spotify. TAPE have moved music retail to the periphery of their business model, (they are returning 90% of digital and physical sales royalties to their artists), have set up a publishing division and launched a merchandising division with eco furniture designer Ryan Frank. They are small, they are agile and they are storming. Rather than make money off traditional and new retail platforms, they are using them as places to build, engage and grow communities and fans of their brand. Interesting to see that music businesses are going back to the roots of digital, for what made digital popular in the first place: people. Online chatter grows and grows: The first DBI (October 2009) tracked 800,000 mentions of survey brands in the quarter, while the fourth and most recent DBI (10.3, August 2010) tracked 2 million. This finding demonstrates that as more Asians come online, they are happy to build or join communities to discuss (technology) brands, pass verdict on products, and share content that catches their eye. The unprecedented rise in social network usage across the region has also not gone unnoticed in the DBI. For example, this quarter, the DBI (10.3) in China saw social networks finally overtaking bulletin boards in terms of total conversation about surveyed technology brands. We all knew people were talking – but the speed of increase has been startling! Tech brands joining the conversation: The past 12 months has also seen technology brands expand their local blogger engagement outreach programs, with some running online competitions for advocate communities (Canon being a great example) to build their social presence on Facebook and Twitter in particular. In Singapore, seven of the 50 technology brands tracked now have a local Twitter presence, with others contributing to a regional or global Twitter ID. Facebook pages are also springing up, with tech brands taking a regional, local or product line approach towards building communities – with some building communities across all three at the same time! However, presence alone is not enough – more needs to be done to build engaged and active communities – but more on that another time. Telcos and mobile chatter dominates: Local telcos are prominent in the Top 10 brands across all eight Asian markets where we run the DBI. Netizens either love or hate their telcos – there seems to be little middle-ground. When you consider the fact that telcos are often the access point to the hottest devices we have tracked – smart-phones – then local telcos have the best opportunity to lead and define successful online brand engagement. For example, Bakrie Telecom in Indonesia, a new entrant to the local list of Top 10 ‘Buzziest Brands’ had 90.9 per cent of brand mentions take place on Twitter – mainly referring to its “Esia” product and service – and has done a good job at engagement. It will be especially interesting to track how such telco social engagement strategies and efforts evolve as people seek increasing amounts of information about popular smart-phone brands that we continue to track such as including BlackBerry, iPhone and Android. As the DBI evolves, we see the opportunity to dig deeper into the hottest technology products, as well as into the specific content that brands are using and creating to engage with online communities. Further, we’ll be able to track specific branded Facebook pages to measure engagement on an ongoing basis. However, that’s for the future. In the interim, you can read more about the fourth Asia Pacific Digital Brand Index (10.3) in the following documents – a personal favorite of mine is how World Cup initiatives helping drive buzz for consumer electronic brands in China. We are keen to hear any feedback you may have on how we can take the DBI to the next level! Disclosure: Edelman represents technology brands around the world, many of which are included in the Digital Brand Index.